Math and choir students from the Izard County School District having been making headlines. The district's elementary school in Violet Hill received an award from the University of Arkansas' Office for Education Policy for finishing third in the Northeast Region for math growth on the ACT Aspire. The ACT Aspire assesses student readiness in English, math, reading, science and writing. The results are linked to college and career data. In addition, nine students from the ICC School District earned All Region Choir honors and had the opportunity to participate in the All Region Choir concert. Senior High Auditions were held at Nettleton High School, and the Junior High Auditions were held at Valley View Junior High School. ICC Senior High students making the cut include Nathaniel Canals, Marek Janda, Michelle Jerron and Abby VanCleave. ICC Junior High students earning these honors include Christian Edwards, Case Everett, Adrianna Fowler, Layla Kirker and Kadyn Risley. 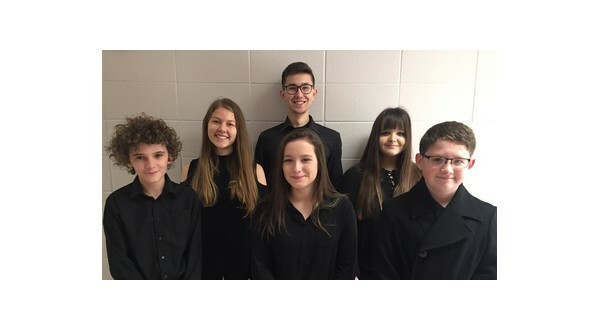 Photo (left to right): Christian Edwards, Kadyn Risley, Case Everett, Michelle Jerron, Marek Janda, and Abby VanCleave.